Brain Machine Interface (BMI) is a technology that directly connects human brain with computers, robots, etc. It is expected as a new interface based on brain science technology. Especially, it is a technology to help the independence of the elderly or the handicapped people. In this research, we are conducting research aiming at applying brain information to the real world. For example, research and development of a brain machine interface (BMI) that operates home appliances using brain information has been conducted in a laboratory that is less influenced by noises. In this research, we are engaged in research and development of BMI in a real environment such as a house. 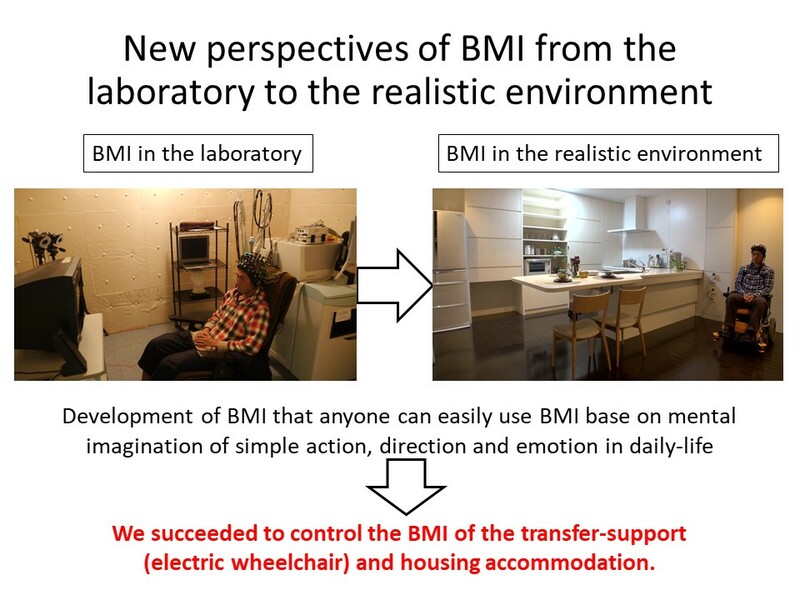 We are constructing a smart house called BMI House as an experimental facility to promote this research in ATR. In BMI House, we can measure human brain status by using portable brain information measurement devices such as EEG and NIRS. In addition, we deployed various environmental sensors to measure environmental information such as human positions in BMI house. We can also control indoor facilities such as home appliances, doors and curtains. 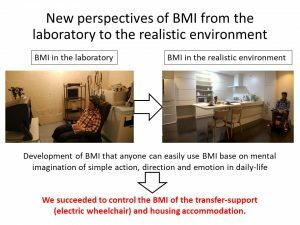 Using the BMI House as an experiment site, we have developed a technology to move a wheelchair safely to a place selected by using human brain state and environmental sensor information, a technology to operate home appliances with brain information and a technology to display human emotion measured by EEG so far. We are conducting R & D on brain state estimation technology by EEG and fMRI simultaneous measurement. While fMRI can measure the internal state of the brain, EEG can only measure information obtained from the surface of the head. However, when using fMRI user can hardly move, but EEG makes measurement easier than fMRI. We are developing a technology to more accurately estimate the emotional state of a person by obtaining the relevance of the measurement result of EEG and fMRI by performing measurement with fMRI in the state of attaching EEG. Also in the future we are aiming to make EEG possible neurofeedback currently being done using fMRI.